It hit me that in this 3rd of 3 years of attending this Stringtopia event, I was most at ease. This simple band or jakima represents this for me. The length of kata, plain weave is where I re-learned how to weave. In the process of making textiles, the weaver devotes part of her life to her weaving. That is why a weaver can tell stories about happy or sad times, and different life events according to the time it took to weave a certain textile. This was the best devotion of my time. To answer the US border agent – no, you cannot just learn this on Youtube. I am the case in point. As I suspected my backstrap loom management was awkward, and therefore, flawed. Working with my waist as the front warp beam & my shod foot as the back beam, Abby gently corrected my process. “Use both swords,” she said. “You will need them both for the next step.” With Abby’s help, and intense focus, I turned the first ideas on their heads. The solution was less taxing, and completely elegant. Friends in class had different problems, and revelations. We walked the cliff edge of adult learning. No-one fell into the gully of frustration. I was very grateful when a more experienced backstrap weaver, Janie Yates pointed out that I was sawing my shed open with the yllawa or string heddles. Janie helpfully guided me back to tensioning the warp open. Where our spirits soared was after lunch. We had hit the objectives. Abby spoke to her identity as a Chinchero weaver, teacher and studio owner. It was pure heart, and so very moving. My culture is also rooted in the oral transfer of knowledge. It’s something I deeply respect. Abby knows what this means for me because I had to tell her, thank her. I will practice and build on this foundation. It was my best takeaway of any Stringtopia. Walking through Stringtopia’s doors the next day made me want to click my heels, or tear-up. Or something. Bricks & mortar matters for carrying textile arts forward. It’s a lifetime achievement to create such a space in this day. Canadian Production Wheels get around. This one is safely out of the direct sunlight! Having taken Abby’s backstrap weaving class the day before, I walked right up to the hanging jakimas. They are pretty. Carol told me that the jakima de kata on the left was woven by Abby’s son. How much of a textured batt can you spin on a drop spindle in 2 minutes, you ask? 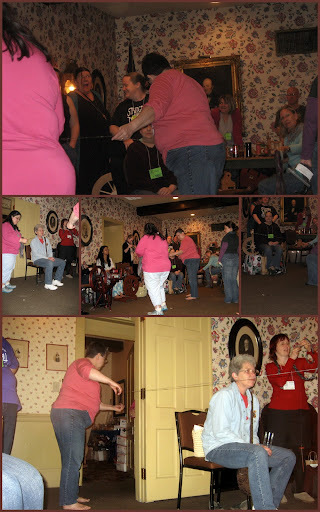 This is our friend, Janet in the foreground helping Mandie pace out her yarn. Taking classes & hanging out with them both was super fun as usual! Respect due to each & every long-draw competition team on Saturday night! Serious kudos to Enting, Laura & Tracy who competed with a drop spindle. I bow to the prowess! I am now home, and rested. I miss being able to rush to classes, hang out in Morgaine’s space, turn around & speak with spinners. If you live close to Stringtopia then I am a touch green with envy. Support them! Until next time I have skills to practice and yarn to make. For example, this 1.6 oz of luxurious Muga silk will also keep me happy and engaged. Categories: Fairs & Fiber Festivals, Fiber Preparation, Getting the knack, Spinning, Weaving | Tags: backstrap weaving, drop spindle, Equipment, Flora, socializing, Spinning, Techniques, wool combs | Permalink.